I noticed that when people talk about the feng shui of the front door, they mostly talk about the door’s color, the direction it is facing, and whether that area is filled with clutter. However, those are just a few of many considerations, and you will soon discover that determining whether the front door brings good feng shui is not a simple feat. 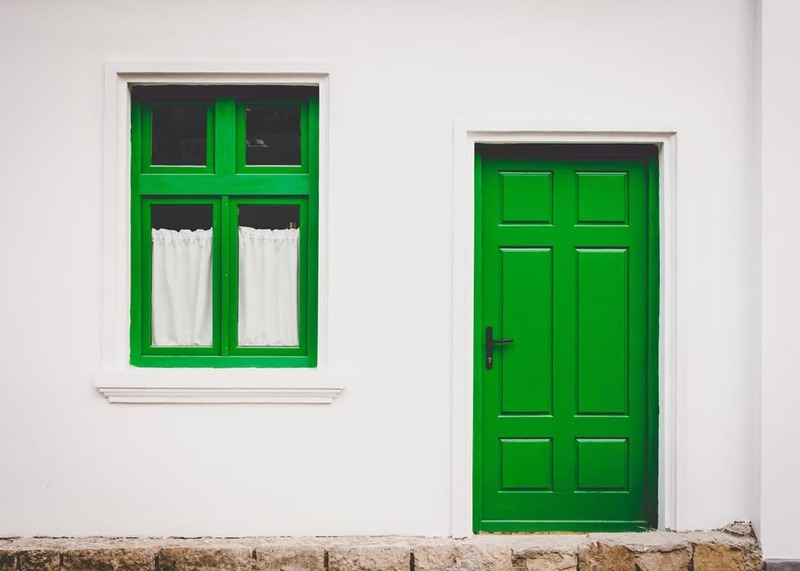 In this post, you will see 19 factors that’ll help you determine how good your front door’s feng shui is, along with tips and cures from experts and personal experience. Why is the Front Door SO Significant in House Feng Shui? If you haven’t noticed, feng shui places heavy emphasis on the front door. Think of the front door as the mouth of the house. It is where the house gets its intake of energy, whether they be good or bad. Having good energy coming through the front door is similar to a person eating healthy. The occupants of the house will be happily enjoying a comfortable home that’s full of positive energy. In a more practical sense, the front door frames your first sight as you leave and enter the house. It works a little like first impression, and it impacts the mentality, mood, and attitude on how you start the day and how you feel when you get home. With that said, let us see the 19 factors have the ability to affect our mentality and energy intake of the house. The size of the front door should be proportionate to the house. You wouldn’t want a small door to a mansion or a large door to a tiny hut. It wouldn’t feel right, would it? Feng shui warns that disproportionate door sizes may cause problems with wealth and career. The front door must also be larger than other doors inside the house. Though most houses today do not have this problem, I have seen master bedroom doors that are larger than front doors. When this happens, feng shui warns of problems with relationships, marriage, and emotional control. The cure is to get a more proportionate-sized door. Though it sounds simple, it’ll require some investment on your part. There’s much about the color of the front door, so I won’t be going into much details here. The type of color you need varies according to many factors. These include the direction it’s facing, the person’s Kua determined by the birth year, and the location it’s located in the house. It is mostly used for feng shui enhancement and cure. 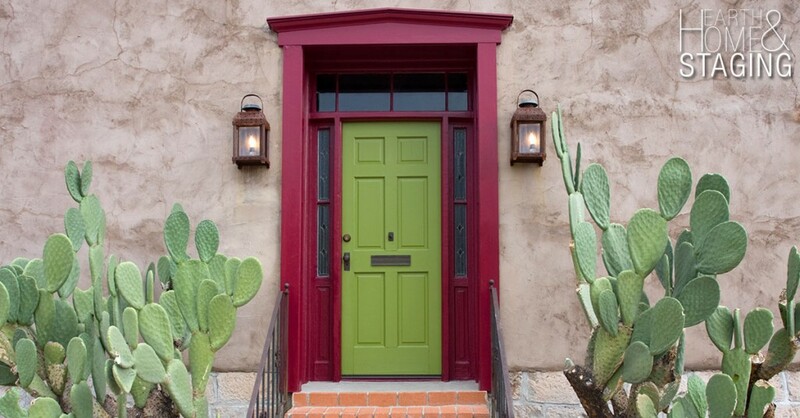 It is not the single factor that makes or breaks the feng shui of your front door. Generally, most experts agree that the color should be more inviting and should easily catch the attention of the eye. Most importantly, it should also be a color that you like and are comfortable looking at every single day. The materials of most doors are usually metal, wood, or fiberglass. Even though you can choose either metal or wooden doors to balance the five elements of that area, I wouldn’t do it if the material is not within your taste. In other words, I wouldn’t sacrifice personal preferences over the choice of materials. In addition to personal taste, the door should make you feel safe and protected. For instance, I’ve seen many apartments in Taiwan that added a metal door in front of the main door for added security. Doors in Asian apartment typically involve two layers of door, with the front one being metallic. Whichever material you choose, make sure that the door is aesthetically appealing and makes you feel safe. Your door should be properly maintained because it is the first experience you have with the house. Here are some questions to tell if your front door is properly maintained: Does it open and close easily? Does it make any squeaky sound when you use it? Is it rusty? Are the paints falling off? 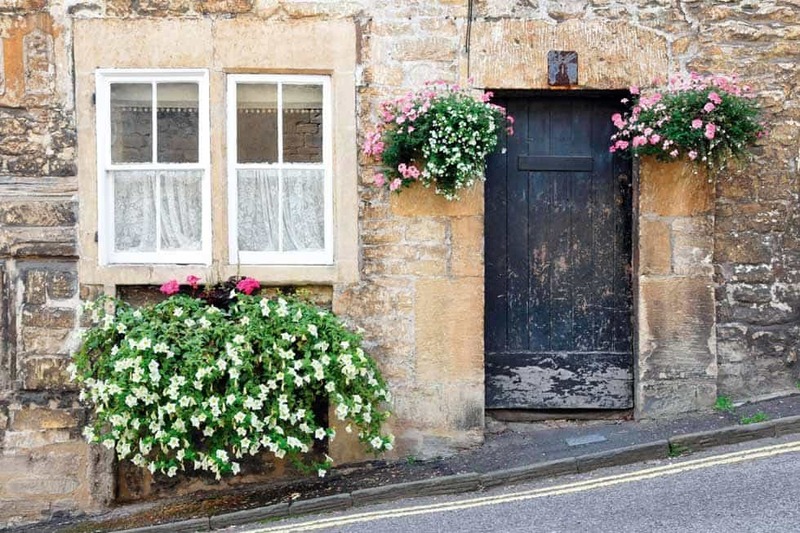 This poorly maintained front door is balanced with beautiful flowers. A poorly maintained door can take away all the positive energy in you as you enter the house. It is likely that as you enter that door, you’re thinking of all the problems that requires attention within the house. In short, it will dampen your mood. Other times, going home may become a drag. You may feel like you’d rather stay out rather than going home. If you invite guests over, how do you think they would feel when they’re waiting right in front of your doorsteps, staring at a run-down door? Whether the front door is facing your lucky direction is determined by your Kua number using the Eight Mansions formula. To give you a brief summary, there are four lucky and unlucky directions for each individual, and your front door should face one of your lucky direction. You can find your Kua number using the calculator provided by Kathryn Weber. If the direction it’s facing is not a lucky direction, you can look into the five elements of the front door which is also determined by the direction it’s facing. If the five element is a match with you, you need not worry too much even if the front door is facing an unlucky direction. On a side note, the direction it’s facing can also help determine where the wealth location of your house is. If you’d like to learn more about this, I have provided much detail of this method in my Feng Shui eBook as well as a case study on how it affected an individual’s life. Again, you will need your Kua number to determine whether the front door is located at a lucky area of the house. If it is not, you will need to use the five elements to determine how compatible your element is to the front door’s five elements. This method is similar to the one mentioned above, which I’ve outlined in detail in this eBook. Another consideration about the location is whether the front door is easy to find. The front door should be easily located by guests that are visiting the house and should never be at the back of the house (I’ve seen those) or on the side. I don’t know about you, but when I go visit these types of houses, I feel a bit intrusive. Further, I can easily be mistaken as an intruder by watchful neighbors when I lurk around searching for the entrance. Does your front door open inward or outward? If you haven’t noticed, most front doors open inwards where you or your guests can easily enter the house once the door opens. Conversely, for front doors that open outward, you and your guests may have to take a few steps back before entering the house. Although this is a small detail, it gives a subtle feeling of how the house welcomes you. This image feels as if someone is entering instead of inviting you to go out. The most common type of “poison arrow” is a T-intersection that’s facing the house. Other types of poison arrow include a long alley that directly leads to the front door. 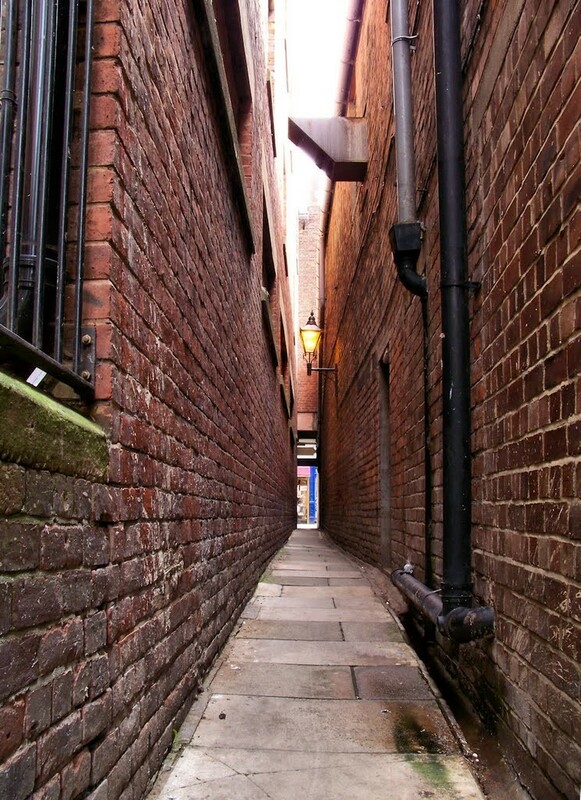 Long narrow alleys are also a form of feng shui’s “poison arrow”. How much problems the poison arrow brings depend on many factors, such as whether the house is elevated compared to the road, the length of the front yard, and whether there are trees or other types of obstructions. Also, as I’ve mentioned before, not all T-junctions are bad feng shui. Some experts suggest hanging a bagua mirror in the front door, but a more practical method is to plant bushes or trees to protect your property from the incoming traffic. This is part of the Form School of Feng Shui, where sharp objects are despised because it brings negative Qi that makes us uncomfortable. These objects are usually shaped in triangles or long pointy objects, which include electric poles, triangular roofs, and stop signs. To understand why it brings negative Qi, I often like to ask people this question: Imagine if you have a knife pointed at straight at you without anyone holding it, how would you feel? How much these objects impact the feng shui of the front door depends on the size of the object and its distance from you. Some experts suggest that hanging a mirror in the front door is able to remedy this effect. Perhaps the reflection cancels out each other? This is also part of the Form School of Feng Shui and similar to the sharp and pointy objects as mentioned above. The corner of the building just barely missed the front door. Corners can make us feel uneasy because they have the ability to hurt us physically. The type of feeling is similar to when you’re sitting at the corner of a square or rectangular table for a long period of time. Your could’ve been more comfortable sitting somewhere else, correct? Some experts suggest hanging a bagua mirror on top of the front door as remedy. Others have suggested placing a pair of stone lions in front of the door if the building is too big and its distance too close. I personally have no experience on how well these remedies work. 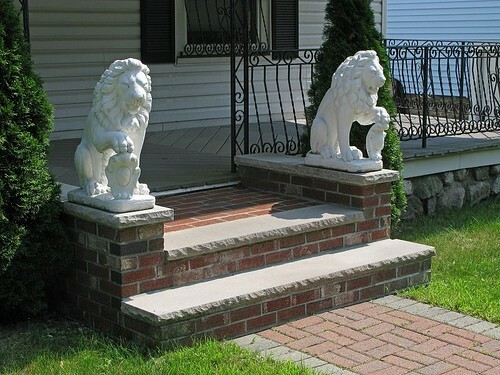 Stone lions are commonly used as a feng shui remedy. The path to the front door should create a soothing and inviting feeling. Some experts, especially the Western feng shui practitioners, suggest that the path leading to the front door should be curved instead of straight. This is because curved roads resemble roads made of nature, and it’ll help brighten our mood because of our innately strong connection to nature. The type of plants on the side of the walkway also plays a big role. To improve the experience of you and your guests when entering your home, plant flowers alongside the walkway because it will provide a peaceful and comforting feeling. Placing cacti gives a less inviting feeling than flowers. Avoid using cacti because, like any other sharp objects, they raise our survival instincts and can physically harm us. How would you feel if your front door is filled with clutter? Seeing and moving through clutter every day when you enter and exit the house can cause frustration and fatigue. Some of you may even feel stressed because it adds one more thing to your to-do list, and one day you might just feel overwhelmed and get overly emotional. The solution is quite simple – just keep the front door area clean and organized. Other more common obstructions include a tree straight from the front door, as well as electric and telephone poles like those mentioned earlier. As long as it is not too close to your home, or if you have a boundary wall or bushes in between, you are in good shape. Some feng shui experts warn that if a stairway faces the front door, you will experience many ups and downs in your life. Others claim that money will roll down the stairway and straight out of the door. A better explanation is that your attention will naturally be drawn to the stairway. Because the second floor is usually private bedrooms, you or your guests will feel awkward because you may feel as if you are invading other people’s privacy. In other words, if you’re a guest, how comfortable would you be to visit the bedroom of the host on a first visit? There’s no best remedy for this situation. However, one thing you can do is to direct the attention away from the stairs. Using carpets that mimic a road that leads to the living room area is one way to do it. Some experts believe that if you can see the kitchen stove right when you enter the house, the occupants of the house will have problems with expenses and troubles with saving money. Other claims that if the kitchen is facing the front door, any positive Qi entering the house will be demolished by the fire and cooking activities in the kitchen. There’s no ideal cure for this unless you undergo major renovation such as building a wall or relocating the door or kitchen. However, you can try to place a screen room divider if you have the proper setting so the incoming Qi from the front door is redirected to other areas. This is just awkward. Instead of being greeted by a warm and welcoming living room, the first thing you see is the toilet. Similar to kitchen, experts claim that the Qi entering from the front door will escape through the bathroom or be polluted by the negative Qi of the restroom. Again, you can put a screen room divider if space allows, which will help redirect human traffic and incoming Qi. Other methods include improving the feng shui of the bathroom or by keeping the bathroom door closed. The problem with seeing the doors to other rooms is similar to seeing the stairway – your attention will be drawn to that room. Not only will the occupants of that room feel that their privacy is constantly under threat, guests will feel awkward and uncomfortable because they might feel intrusive. The solution is to add heavy furniture, such as tall book shelves, in between the two doors to serve as a wall if space allows. Though a screen door divider can improve the experience of guests, it may not be enough to improve the comfort of living in that room. Many feng shui experts warn that if the front door aligns with the backdoor, all the energy that flows from the front door will go straight out of the backdoor. Some interpret this to mean that money will fly right out the back. Other explanations include that you will be naturally drawn to the back of the home and you won’t be appreciating the other areas of the home. Placing furniture in between is a way to remedy the effects when the front door aligns with the back door. The cure for this is to add furniture in between. These can range from sofas, fish tanks, book shelves, and a screen room divider. Placing a mirror on the opposite wall of the front door is said to cause the energy to bounce around relentlessly, which may bring unsettling disturbances in the family. Others have said that the mirror can push all the fortune out of your home. Our eyes are embedded with motion detectors, and any unexpected movements in a mirror will alarm us. If a mirror is right in front of you when you enter the home, you may feel as if someone is walking towards you and startle yourself. It is just bad experience. The remedy for this situation is quite simple. Simply place the mirror on the side walls rather than on the wall opposite of the front door. The area inside the house should have an open space and clutter free. This area is what’s called the “bright hall”, which applies to both the inside and outside area of the front door. Placing a carpet or other types of flooring can help define the boundaries of the “bright hall” area. The “bright hall” is where the Qi is said to gather, so it is best to keep the place clean and organized. The size of this area should also be proportionate to the size of the house. Placing a screen room divider or using a different set of tile colors can help define the size of this area. Today, many of us use the garage door more frequently than the front door (like me). If that’s the case, the front door feng shui should have little effect on you. And even if you have superb front door feng shui, all the good energy that you’re supposed to reap the benefits from will practically be non-existent. This is because, as some experts suggest, that the person entering the house brings the outside Qi inside. Likewise, the person living in the house will bring the energy from within the house to the outside. This is why simply opening the door and letting the air inside wouldn’t work, because the energy has to interact with humans. This is also why it’s called the “front door” in the first place. It is the main door that people use to enter and leave the house. Determining the feng shui of the front door is not a simple task, and none of the 19 considerations mentioned above are definite or absolute because one factor can greatly outweigh the other if the conditions are right. In other words, not a single one of the considerations mentioned above can make or break the feng shui of your front door. For instance, sometimes obstructions in the front door can help remedy the effects brought by a T-intersection. If you are serious about improving the feng shui of your front door and of your house, I suggest that you hire a professional rather than do it yourself. Here’s what you should do to get the most out of a feng shui consultation, if you decide to get one. Do you have any other front door feng shui considerations that you would add to this list? Comment below and share it with us! Front door facing stairs (whether up or down) is not the best. Adding a divider in between will help! Hi Victor, thanks for this article. What’s the remedy for a front door facing a downward stair case? There’s not much space for a partition. Thanks. I am also out of ideas in this situation, and I don’t think placing any crystals or objects will help as what comes into the front door would just go down the stairs. It just means that you won’t be getting much Feng Shui benefit from your front door. If I have a business I heard I could bury double axes to protect from bad luck where would these be buried? I have not heard of this, and I think this is more superstition than Feng Shui. I think you can consult spiritual masters for guidance. 1. I have a 2 bedroom condo on the 19th floor of my building. The unit is shaped like a shoe box. Upon entry, the dining is on the right, the kitchen on the left. After the dining is the living room which is directly opposite the bathroom. There is a wall afterwards that separates the bedrooms, the doors to the bedrooms are located here with the door on the left leading to the masters and the door to the right leading to the kids room. 2. My front door facing east upon entry is directly aligned with the masters bedroom door. If this is bad, is there a remedy for this? 3. Though my front door is facing east, the front of the unit is actually opposite. The bedroom windows facing west are directly parallel to a busy highway with a magnificent view of the city skyline. 4. I have a balcony on the masters bedroom. The door is made of glass. Directly opposite of this is a dresser with a mirror. The dresser has been incorporated with the construction of the finishing and there is no other space for it. 5. My kua number is 3. My unlucky direction is west which is the total loss direction. Does this mean I am actually deflecting bad luck? Am I also deflecting luck even if west is not a good dirction for me? 6. My wealth direction is in the south where the bathroom is located. Is this a problem? 7. I placed my pet turtle with the aquarium and running water on the north of the apartment where the living room is located for luck. I’ve been reading a lot of contradicting views on Fengshui so I thought Id try to ask directly. Many thanks in advance for your response. 2. Front door aligned with your bedroom door erodes your sense of privacy. The easiest remedy is to add put a big furniture or a divider somewhere in between. 3. Looks like your front door is good for Kua 3. The building’s front door is secondary and is not unique to you. 4. The mirror in your bedroom may make your bedroom unusually bright (maybe that’s what you want). Bedroom belongs to Yin and should be darker. You can use colors to balance this if you find it too bright. 5. You need to check what’s in the western section of your house. Ideally, it should be your kitchen or restroom. 6. There “could” be a problem with your wealth direction. Other analysis is needed to confirm, such as using the compass school’s technique. 7. Although your Kua’s north belongs to Earth (which destroys water), North in bagua belongs to water and should be good for aquarium. Everyone’s situation is a little unique. Even if they live in the same unit, the person’s Kua could make the difference. A floor plan and a Lua Pan reading can clarify your confusion. That’s why I suggest you get a consultation. Let me know if you need me to refer someone to you. Hi Victor, Thank you for the article. We just recently bought a home, and the front door opens into a hallway wall. It isn’t something structurally we can change. Is this bad for Feng Shui? Anything we can do to soft the flow? Hi mix2, you are in good shape because it’s not bad feng shui. You can enhance that area with some plants if it suits you. I’ll be publishing a post soon about plants soon. Stay tuned! Thank you Victor!!!! Look forward to your new posts! My house faces south & the kitchen is west. I am remodeling so where should. My kitchen is a u shape. My walls are south west & north. Pls advice. I don’t think you finished your comment about remodeling. If you’re talking about the kitchen door, I suggest that it doesn’t face any of your rooms or the front door. If your house faces south, hopefully your stove doesn’t face the opposite direction (meaning you’re facing south while cooking). Tall leafy plants are great for front door, but not so much if it’s in your chueh ming (see: https://fengshuinexus.com/blog/feng-shui-indoor-plants-guide/). I would suggest placing a tall/heavy furniture instead of plants – something that mimics a wall. We rented a new apartment in Bordeaux and I just realised that the door of the flat (which is on the last floor) opens to my Chueh Ming direction which SW cos my kua number is 1. However all the windows we have is on the opposite side (NE) we dont have an opening to the SW other than the door of the flat. And as its also the love and marriage direction I wonder if this can increase the ‘already existing’ problems in my marriage. I have put a console with red light and rose quartz crystals and a photo of us on it, using a cloth with red, orange and purple colors to intensify the fire and love energy. Do you recommend anything else, like a plant etc? Honestly, many other areas need to be looked at for a proper answer (such as using flying star in addition to the Eight Mansions and Bagua you’re currently using). As for your Kua 1, South is your personal love/marriage direction, so hopefully that area is free from bad feng shui. Also, check the Kua of your partner and find the love/marriage direction and do the same. From how you’re describing it, does your front door align with any window? I’m asking because there are many other factors that bring bad feng shui. Here’s a rule of thumb: before enhancing feng shui (like with crystals, plants), you need to identify and cure the bad feng shui first. If you need a referral for a consultant, let me know. No there are no other windows aligned with the door. All the windows are on the opposite. My husband’s Kua no. is 9. I think the place I put all our marriage photos and decorated with pink crystals and red candles is in the south corner of our flat. Well after all i think its not the end of the world if my door is opening to my chueh ming direction, isnt it? If using the Eight Mansions, you should (1) check which area of the home the front door is and then (2) check the direction of the front door. If both are bad, then use the direction to find the five elements of the front door to see if it matches with you. So yes, you’re right Marilyn! It’s not the end of the world if your door is opening to your chueh ming direction. Hi! Just wanted to let you know that after going through several articles on “colors for front doors” – yours was the best! Hi, We are in the process of buying a house. What’s your thought on the front door is on the side facing the garage? The front door facing the garage? Hard to imagine what its like, but it would seem harder to gather energy from what’s outside into the house, because the garage has blocked it’s path. Buying a house is a big decision. Don’t let one factor influence your purchase decision! Hi Victor, Also, if the front house’s auspicious direction is conflict between the couple, who’s best direction should be selected? Thanks! Ideally, the front door should benefit the breadwinner, or the person who’s outside working and making a living for the household. The bedroom, on the other hand, should be selected for the spouse. Using what I know from Classical Feng Shui, I have doubts on whether those would work. It’ll certainly help people find your front door, which is a good thing! But then, “remedies” are used to cure bad feng shui. In your situation, it’s not necessarily a bad thing. It’s just that you gain little Feng Shui benefits from the front door (I’m assuming if you open the door, your view is blocked by the garage). Also, you won’t have to worry about your front door facing any bad forms, because the garage blocked it for you! My troubles are lengthy and I have been working hard to feng shui our home in hopes it may sell. I never liked this home however my husband insisted we me the purchase 4 years ago now. We spent 3 solid years doing extensive renovations and are now selling at a major loss. Our marriage our 5 years is almost in the trash but we have a 3 year old to think about. Everything is wrong with this home, spiral staircase with no light, many tall windows upstairs, a weird entry to the home off a long narrow balcony on the side of the home, a sliding door at the top of the balcony that could be used as a front door which looks at the master bedroom, bathroom and kitchen with a sitting room between. The southern section of the home has an indoor sunroom the whole width of the home with an overhang cutting off both corners. Any suggestions? I just want this home to sell! Is it really that bad for a main door of a residential condominium to face directly the kitchen door? Thanks! In short, it’s not really that bad. You just won’t have the help of Feng Shui. Here’s the idea: the incoming energy from the front door gets cancelled out when it enters the kitchen (kitchen is considered a place of negative Feng Shui because of all the cooking, fire, grease, trash, etc.). If you use some other door (like garage door), or if you have other outward facing balcony (like apartments), more energy are coming from there than the front door, and you’ll also be fine. Yes, you got the right idea! You should put something behind the sofa if it’s not against a wall. The furniture should be heavy that mimics a wall for support. Staircase facing front door and ending to a toilet door are both Feng Shui no-no’s, and their effect differs by individual. I’m afraid I don’t have any easy cures for both. You might need to find someone who has experience in dealing with both. FYI – installing a crystal here and there won’t do the job. Sorry if I couldn’t be of more help. The numbers you talk about are more related to numerology than Feng Shui, so it is NOT a bad Feng Shui thing. People just don’t like to say or repeat certain words all the time, which is why people refrain from moving into units with those numbers. I think is has been a few months. I need some clarification because I getting conflicting recommendation on the direction. Being a west group Kua number 7. Which are the auspicious direction the house need to face? The general rule is that the western directions are auspicious, such as West, Southwest, Northwest, and Northeast. The Kua of the head of household is generally used. If direction is unfavorable, then you check the five elements using the direction of the house to see whether it matches you or not. Thank you. I am in the metal west group with Kua 7. We found a house with the facing of NW direction. Is it good to have the master bedroom at the south or southeast corner of the house? I read that is not good, if it is not is there anyway to improve the room? One clarification I am Kua 7 male, is the direction still as you wrote earlier? West, Southwest, Northwest, and Northeast. In addition, does it mean house faces Northwest is good or does it mean sitting northwest faces southwest? Yes, the direction is still the same. Both sitting and facing you mentioned is good. As for your previous comment, the bedroom’s location should be more in tune with your spouse’s Kua than yours. Just so you know, a tip here and there will do little to help you with Feng Shui. I suggest you talk to an expert to have all your questions answered. Do you need a referral? Thanks for your advice Victor. Is there an expert you can recommend? I’m not sure where you live and whether you need a local consultation or not. I know Donna or Laurent can help, because both can do video conferencing. I’ll email you their contact info. In your instance, Feng Shui may have limited abilities to help because you cannot apply Feng Shui to the house. The best you can do is to Feng Shui your room so you can rest properly. You’ll be fine. That’s what the storage cupboard is for and a great placement too! Did you get any help on this?? My stairs also face the front door and ending to the door to toilet at top of stairs. I need help with this too. 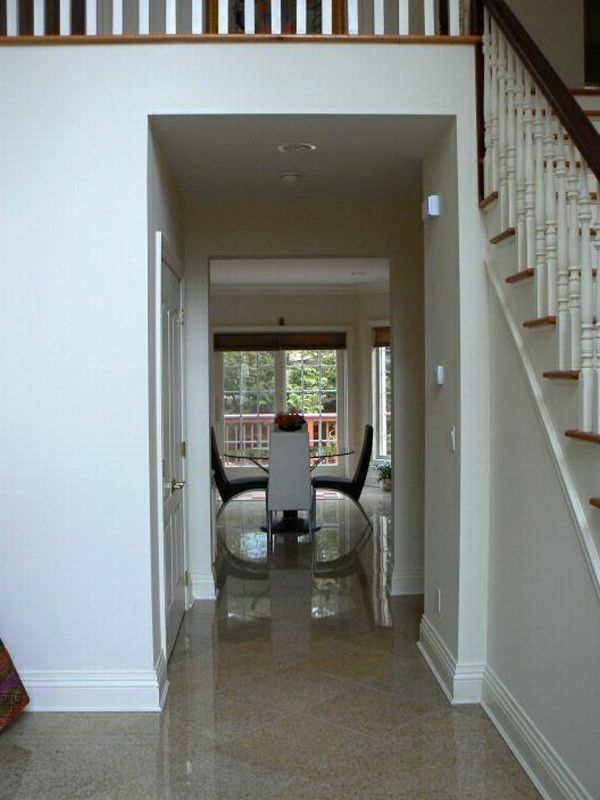 If space permits, a screen divider between the front door and the stairs would help. If not, some experts have used colored carpets to direct the path away from the stairs. Hi! Your comments seem very helpful so here goes. My pearl string house (sits 125 SE and faces 305 degrees) is newly renovated and we are planning the landscaping. The house is partially bermed into the top of a hill. There will be a parking pad dug into the hill to the left side as you face the front door, then a series of stairs going from the pad up to the door. The architect has designed a wall to the left side of the parking pad at such an angle that the wall points directly at the front door and thus might be a poison arrow. Maybe we could solve this by curving the wall. My question is: should we curve the wall away from the front door towards the side of the yard or would it be okay to curve it gently towards the center of the yard? Thank you!! I’m not sure if I’m picturing your property correctly. But it does seem that both of your solutions work, because the poison arrow is avoided. As for me, I would choose to curve it to the side of the yard because you’ll have less hard corners/sharp turns for the wall. Thank you! Your reasoning on which way to curve my front yard wall sounds right. My husband thinks the poison arrow of a straight wall won’t matter because the wall will be at a lower elevation that the front door (about 4 feet lower). I think that if you can see it, it’s pointing at you! What’s your opinion? You’re right. Normally, it’s negative when you can see it. In authentic Chinese feng shui, there is a saying that “if you do not see it, then it is not a sha (Xa, or bad) chi”. I.am planning to.enclose our porch to change the position of our main entrance, to avoid negativity because of the perfect alignment of our sink(faucet,) stove, dining table, maindoor and gate But i would still put window which will.be opposite our gate. Will it be ok? Thanks. I hope you could help me with these ! And i hope you understand my explanation sir! I read both of your explanations, and I think I understand the big picture. Ideally, do not place a window (or door) opposite of your gate, or aligned to it straight. But what you’re doing is right – placing a display cabinet in between. So I wouldn’t worry too much if I were you! 1) main door is facing another neighbor’s main door, and also it faces our 2nd bedroom door. We are not using that 2nd br as sleeping area. It became our dresser and were also planning to put a desktop where i can do work at home. We managed to put wooden wind chimes with 8 metals on both rooms. I also put a screen curtain on the 2nd br door so we can still open it during the day ( since most of the time the cold wind is coming frm the windows in that area. Are these cures enough? 2) living room, dining and kitchen are all in one place. We’re planning to put the sofa on the wall where the front door and the 2nd br door lies, since it’s the only solid wall we have, but the tv cable wire is also on that wall so we might buy a wood or a thin log just so the back of the sofa can’t smash the wire. Another thing, theres 5-6inch wide beam above it. How can i soften that? 3) due to limited space, our dining table is in line with the bathroom and laundry door. What to do? Your help will be much appreciated. Thanks Victor! 1) Did you mean a screen curtain or a door curtain/drapery? A doorway curtain for your bedroom door would be great in your scenario. And are the wind chimes okay? Or should i still need to put bagua? Thanks for the info Pau! The wind chimes are ok, it’s mostly used to raise the Qi of an area (which I don’t think you have a problem with). There’s no need for a Bagua too, it’s mostly for Xa from the outside. Looks like you’re faced more with front door problem, where you’ll find trouble focusing if you work in br2. Placing a divider at the entrance of your front door would do the job (if space permits). I think a door curtain will also do, but not as good as a divider. We’re planning to put the sofa with it’s back to the wall in between the two doors (main and 2nd br), is that already considered as a divider or should I still need a divider or a plant besides the sofa? Thank you for entertaining all my question Victor! Hihi! Somehow this comment just further confused me. But if I’m picturing it correctly, a plant would do nicely, especially if it helps soften up the beam. Lol! Yup im confused too. Where should i put the divider? Is that on the entrance on my 2nd br where im going to have my home office? Hi Pau, where to place the divider will be up to you! When in doubt, always seek an expert to take a look at your place. What i mean on #1 is that i managed to put wind chimes on both doors not on rooms. Thank you, Victor! no poison arrow pointing at my house! and no bad chi disturbing my marriage! I appreciate your confirmation. We will curve that wall! Thank you so much sir victor for your response. My concern this time is our stove which is just beside our sink and opposite our comfort room’s door. And how about my plan of enclosing our porch, will.it be more okay if i will continue with it or there is no need! Hi Victor, can you advise how to measure the size of the main door? Should it be measured from outer side of one frame to that of the opposite side, or should the size be that of the actual walk in space (ie from one side of inner frame to the opposite side)? Somehow your comment went to spam. Anyways, it’s the actual walk-in space. Think of it as the opening where Qi can enter. Or, you can use the dimensions of the actual piece of material (wood or metal door). Thank you sir victor! Your site help us a lot! We are glad to hear your suggestions.. is it bad feng shui for a stove near the sink and a stove opposite the comfort room”s door. Is it a good idea if i still enclose my porch? The easy solution is to close the door. But if you’re still somehow bothered, try placing a door curtain over your restroom door, similar to what restaurants do. Hi,Victor. I am just starting to learn about Feng Shui so I am still at my front door. It faces North…well, more northwest. the entry is large…..not messy or confining. But there are two steps to take up to get to the main level that has living room, kitchen, bedrooms, etc. There are aksi stairs to the right of the entry that lead to the lower level. I know all of these stairs aren’t good but there isn’t much I can do about it. Once up the two steps to the main level, the south facing wall of the living room is mostly windows overlooking a lake. What should I have in the entryway to brighten it up. There is a coat closet on the east side and, though the area feels open, I don’t feel it’s large enough to put larger objects in it like a big plant or something…..seems like it might make it feel cluttered. The flooring is tile. Maybe just an entry rug with bright colors? Also the door is made of wood and has a natural stain. Do I need to create a cure for that? there is a fountain directly outside the front door. Thanks so much for taking the time to answer all of our questions. An entry rug with bright colors can do. However, you’ll need light so the colors are more visible. 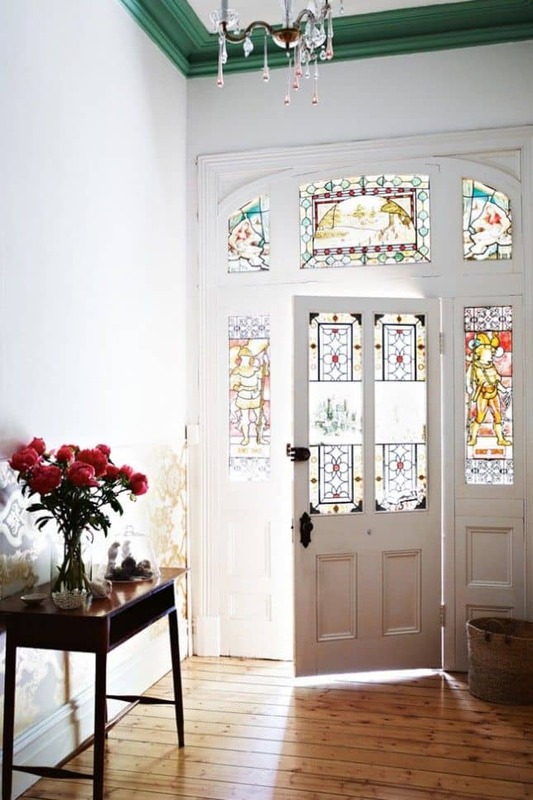 Have you considered adding a window near the door? What about those translucent glass on the side of the door? Also, you don’t need a cure for natural stains for wood. A fountain directly outside the front door is great! Just remember to keep the water clean. Wow Excellent Blog Article…Nice Informative about fengshui for garage door. We’re building a new house. It’s only 82 square meter. The thing is we never learned about feng shui. May I know your thoughts on this. Main door facing our kitchen and our garage door is facing another door. Construction is almost half done and it seems that there were bad feng shui in it. Do we have remedy for it? I mean, should we put plants or any house decor to avoid bad vibes? Thanks for your insights. Easy remedy for main door facing kitchen is to place a divider between the main door and the kitchen, if space allows. As for garage door facing another door, it’s best to avoid having them face each other. There’s no easy remedy there. Hi Victor, what is the feng shui on a house with no front door, only garage door or back door used for entry? What you’re describing is extremely weird. Front doors can be thought of as the “mouth” of the house and is extremely important in terms of Feng Shui. It is where Qi enters the house and benefits the occupants. That said, a house without a front door would have “less” Feng Shui for the occupants to benefit from. 1. I was just confused about the front door, is it the opening of our terrace or the front door itself? My husbands kua which is my breadwinner is #7. His lucky direction is west and north is his bad direction. The opening of our porch is on the north but our front door is on the west.. is it a bad fengshui for our us. 2. I am thinking of enclosing our terrace to change my front door to west but i am.just worried about he covered drainage which is maybe 2 meters away infront of my plan front door(west)it runs following the west direction meaning it goes outside our property. Just Beside my plan front door is a covered well. (water deposit) and near to it is our front gate. (Our entry way). 3. I am considereng all the bad fengshui in our house because my husband and my son is dealing with a major problem with their kidneys and seems that i find it difficult now to save from what my husband gives me. I hope you understand my explanation sir victor and i hope you could give me the best remedy. 1. It’s the opening of the front door itself – the opening where energy enters the house. Having the door on the west is good for you. 2. Not sure how this looks. I would suggest you find an expert to identify whether it’s good or bad to do so, and to identify other potential negative energy that’s lurking outside your front door. 3. Feng Shui can definitely affect the health in specific ways. A really good one can tell what’s going on in your life just by looking at your house. They can even pinpoint specific types of health problems you may be experiencing without you telling them anything. My kua number is also 6 which is west is my lucky direction as my husband. My kua number ia 6 which is west is my lucky direction as my husband. Thank you! I just want to correct, my husband’s wealth and success direction is northwest. Hi, I’m asking about the house I bought is the maindoor is facing at the T entersection of the road. There is problem of that? My front door faces huge built in robe which I use to store shoes In addition it also has 2 mirrored door. I have removed 1 door and covered the other mirror with it So now there ‘s 1 mirror facing the other and the wood facing the door However all the ugly shoes are in sight as soon as the front door openS Should I stop using this for shoe storage Wht is best to be stored here? Books perhaps? According to Uncle Dixer, our in-house Feng Shui consultant, it is completely fine as long as you keep your shoes neat and tidy. My husband the breadwinner kua number is 1.Our house faces east, our master’s bedroom is in southwest and kitchen is directly under it . The toilet and bath is on the southeast next to the master’s bedroom. The staircase is next to the front door but is on the side . The landing though upstairs is directly on top of the front door. My concern is the front door is small and faces the porch door which is considered the front door. Is this okay? It is a concern if both the porch door and the front door forms a straight line. The easy fix is to place something in between, which a screen divider can do. The space between two doors is very tight to place another screen door so we were planning to make the porch big and make a big front door.So energy can come in. But that is not until a good few months when it’s spring or summer.Is there a smaller alternative. Can a chime do? When you make changes, remember that the front door should be the biggest door in your home. As for both doors facing each other, a chime would not make much of a difference. The alternative is just to keep one door closed at a time (not having both opened at the same time). Remember to find a trusted consultant if you have more questions! Thank you so much for this article. I just did the calculator to find out my Kua number and my husband’s Kua number. We have the same number 2. We sold our home earlier this year, which had a North facing front door (including the garage door), which apparently for both of us was the worst direction to have. The things in the description of what could happen to us with a North facing front door became true! We have suffered from infertility, we also lost a baby at 19 weeks earlier this year. We also struggled financially while we were in that house. We sold the house in June and for a couple months things looked rather bleak, my husband lost his job and we were living with a friend. But then my husband found a job making twice as much money in another state. 1) We have nowhere else to park except directly in front of our house. However, we have enough room to park either sideways to the house or pointing to or away from the house. Would this be a factor and if so, which would be the best direction to park? 2) What can I do to enhance our front door to keep the new-found wealth coming in and also enhance our health? It seems that even though we are making more money now, we have been struck with unexpected expenses and some health scares that luckily have not been big deals. Thank you so much for any advice you can provide. This article was very helpful and I appreciate you taking the time to write it. 1) Park your auto whichever way you feel most convenient! How you park would not affect your Feng Shui. 2) Keeping wealth depends on many things, with Feng Shui as one of it. And within Feng Shui, it’s much more than just the front door. You should check the wealth areas of the house to see whether they’re a good match with your husband’s and you. Time (flying-stars) is also a factor that can be quite powerful. I’ll be publishing something about wealth in the coming months. Subscribe and stay tuned! Another note: if you truly want Feng Shui to help, I suggest finding an expert. He/she can usually make accurate predictions on what will (or had) happened to the occupants after looking at the house. That’s how you should qualify them as expert or fake. I’ve been reading everyone’s response I have an odd one. I’ve been working on feng shui our home. Our door is hardly used because our attached garage is on the side of our home an was turned into a bedroom with a hallway an we now use this as our door we never go around to the front door ever. My whole foyer is set up for my career room an I have a budda when u enter but no one comes in an out of that door for 10 years now. we always an company always go to that side door it has a white storm door on it. We always struggle no matter what we do I feel our chi is off. Am I using the wrong door for my main entrance? Your situation does seem a bit odd. The front door could be the problem if you’ve noticed changes in your life after you changed the front door. The door itself shouldn’t matter much, but which sector of the house it’s opened and which direction it leads to matters greatly. I suggest you find a consultant to take a deeper look at what’s going on. How would I know if in what direction is our front door facing we build a mini sari sari store in the front side area of our house and the front door of our store is directly facing our house main door but our main door has a screen door would it be ok to stay that way or we have to do some renovation for our main door and store main door. If you’re saying that the home’s front door and the business front door aligns in a way that forms a straight line, it’s not preferable. A simple solution is to place a divider in between. The divider is preferably placed that divides the business area from the residential area. Hi ! Is it any problem if my front door facing straight to my neighbor front door ? I am assuming that you’re referring to your neighbor right across the street. Some experts say it can be a problem as you and him will be competing for acquiring Qi from the front door. However, I don’t see that as a problem. Hi victor ! How can I solve this problem ? I wouldn’t call it a problem. Nevertheless, if you’re competing for Qi, one way is to have more human/pets in the house. It’s usually the ins and outs using the front door that brings the outside Qi to the house. Im renting and my entrance door has a closet with door mirror facing the door is there anything I can put to contradict the donts? I can’t remove the the mirror, I read to put a big plant beside the mirror, is it true? The easiest way is to cover the mirror. And like you said, a big tall plant can also do the job. Hi! What if the front door is not level to the road. It is lower than the road and to get to the door, the porch steps is going down instead of up. 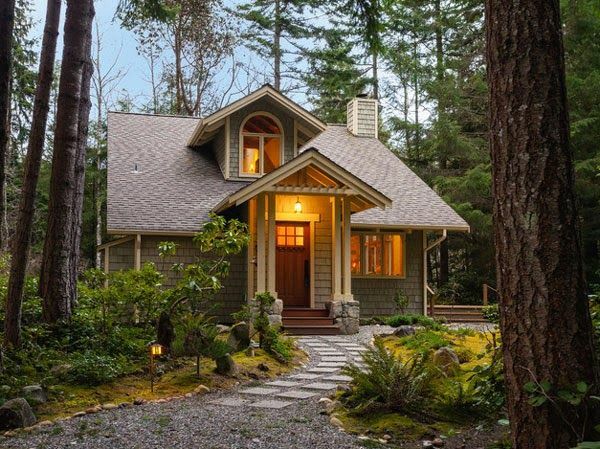 Ideally, the front door should be higher than the road with the porch steps going up. I don’t think there’s an cheap or easy remedy for this situation though. Ask your trusted consultant to see if he/she has any ideas. I’m not sure what a service gate is, but I’m assuming that it’s a gate. Alignment with the front door is ok. Something in between, like a fountain in the middle, would be make it even better. The problem is when the front door is aligned with the back door with nothing in between. If so, the easy cure is to place a divider or a some furniture in between. I have a mirror above the fireplace in the living room, which is on an outside wall. I have been told that this is bad feng shui to place a mirror on an outside wall. Is there a cure for this as the mirror would not look right anywhere else and does look good there. Not sure how mirror above your fireplace is on the outside wall? If so, if getting rid of the mirror is not possible, simply covering it will be good. Doesn’t have to be covered with cloth, some decor that blocks it will also do the job. Great advice! I have been working very hard in my new home and just came to the realization I may be using the map incorrectly. I’m on the 2nd floor of a duplex, we share a mutual front door, straight up the steps is the door to my home. Once you walk in, there’s a hall to the left that leads to a room behind the front door of my unit. I’ve been just using the map without consideration of the door to my home supposed to open into one of the three guas knowledge, career, or spiritual. My front door opens to the children/creative gua and I use the room behind it as the spiritual room. My question is, how do I map this out when there’s a room behind my the front door to my living space? I’m not too sure how things look here. But if you’re trying to map the Bagua of your home, the room behind your front door should also be included, assuming that room is part of your living space. – is it alright if the house faces a few parking lots just across the small street? The parking lots across the street are perpendicular to the house. – is it advisable to buy a house just next to the back lane and the back lane faces directly the T junction. The back lane does not join the T junction. It is blocked from joining the T junction by a paved curb. The house is facing the road. I hope my explanation is clear…. Parking lots are fine. It’s no big deal unless it’s a huge parking structure that overshadows your house. Hi, the road comes to a T junction just facing the side of the house . So is the house affected ? It doesn’t go to the front door so you’re ok. If you can see the T junction when inside the house through any window, just make sure to cover it so you don’t see it. Hi Victor, if the door faces a good direction for me but it’s located on the side; it’s a condo. Is this inauspicious? Thank you! I live in a condo too. No worries if the door is located on the side. Hi, I’m so glad I found your site. I really like what I’ve read on your site tonight. I’m trying to start a new type of research and investing for me, so that as well as dealing with the everyday long term health and family issues. I’ve been reading for days and days and the more I read, the more I find that contradicts, ideas on which cures are best to use. Below I’ve included the things I’m most concerned about. So after days and days of in depth reading, I’m pretty confused on what I should and should not be doing. I’m hoping you can give me some suggestions. 1st should I be figuring the layout based on the west facing living room glass patio door and balcony (I’m on the ground floor) or should I be using the north facing front door? Also the entrance to this 4 plex condo building is west facing. 2nd problem, my front door is dark green and there is a metal white screen door in front of the green wood door. I was considering putting a spring wreath there, but not sure what color flowers to use…any suggestions? 3rd, looking out my front door, to the left, are stairs going up. I’m not under the stairs, but I’m to the left of the stairs, would you use a water feature ( like a small water fountain or hanging plants to the left of the door as a cure for the stairs? I already have Jade plants and Spider plants, outside, as you approach the front door. 6) something, like a purple vase and or something purple.I’m pretty confused on this area. 7) The career area, I think I can safely add a picture of a waterfall here, is that correct? 1) You should be using the front door because it is where people come in and out. 2) I’m not sure what you’re trying to do there. Might not be necessary. North is water, and there’s really no need to boost that place’s energy if it’s not needed. 3) Stairs on the left outside the front door won’t be too big of a deal. It’s not directly facing your front door. 4) Southeast is water in the Bagua. North should be the area of focus. Are you using BTB Feng Shui? 5-7) Career area depends on your Kua, Bagua, and flying stars. There are many ways to do this. I think it’s best if you get a consultation. Let me know if you need one. i am moving into a new home after a very difficult divorce. The temporary home i am living in now has the front door facing torment. Which has been accurate the last year. My new home is facing Latent. the front door enters into a long hallway, and there are three arches on the left that lead to bedrooms and an office. you can sre the fireplace directly on the opposite end of the house from the front door. Is latent good for new begginnings and a successful future? If you’re using your Kua, you should also check which sector of the house the front door is located. You’ll have to divide your house according to the eight directions to find out. I’m not sure what Latent is, but as long as its a good direction for you, and if its located in your lucky sectors, then you’re good. also im a Kua 8 if that helps. Any consultant in Loudoun County, Virginia, please!? I don’t know any consultants there. But let me know if you need someone who can do an off-site consultation. Yes please. We need a highly experienced and qualified person as we will be remodeling the house (changing stairs, adding rooms), we have a child with chronic illness who needs a good energy set up around the house as well. If you know anyone in states out of the state we can get a distant consulting we would be very grateful. Understood. I will be emailing you shortly. HI Victor,My bedroom door lies is southwest corner,is it ok or any modification required? Thanks ! I do not know because I have no information about you and your home. If you’re sleeping well and life is going smoothly, there’s not much you should worry about for now. its in the center of the house. Sorry the front door is facing “defence” one plus, according to this fung shui compas on my phone. Im in Colorado, any one you can recommend? I don’t know anyone in Colorado, but I do know someone who does remote consultation. I just want to ask you, if I use my kitchen door as my main entrance now, do I conceded that as my front door when I look at fung shut my home? Please help me! Thanks for your blog. Need your advice. The floor (inside the house) is lower at the main entrance, before the living room flooring which is higher. Is this any bad? Should I level it same height as living room flooring? Appreciate for quick advice. Don’t worry about this. In fact, I think this is quite common in Japanese architectural design. No color is best or worst in Feng Shui. You can use blue for both doors if you desire. I would suggest that you use a color that you like! Above answer is helpful but just wondering what is solution for it, if there is no 2nd door. Also, there is dinning area between Front Door and Kitchen. Another thing is, stove is located 90-degree, so cook would not face front door directly. Would that help not cancelling incoming energy? hi victor thanks for the information. i had a problem. we rented a house in an apartment which is south faced.the main door in front of our house is facing towards the main door of north faced other apartment. since we arrived i got failed in easy exam that too last semester of my exam-later solved .this happened in 2015 september. since now am unemployed. i have attended many interviews i got selected for some company’s but due to some circumstances i didnt join. there is lot of breakage in my career growth. moreover my neighbor & we had clashes in between. she always throws the dust of her entire house into the north east corner of our house-may be some kind of sentiment. a mirror is placed right infront exactly to my rented apartment main door by the neighbor who exactly stays in front of our front.am suffering with health problems too.now am at worst. please advice me what changes i should do……it will be very kind of you…….& thanks in advance. 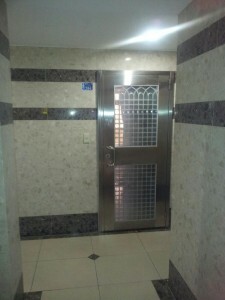 Our main door facing toward east and gate towards north and lift is not exactly in front of the gate ,it resides by left side but when we open the main door able to see the lift please give any solution for it.or its k to cover the gate by any sheet so that not able to see the lift .ours is 2 bhk flat and gate is also Small one. I see that you asked Uncle Dixer the same question. Check your email for your answer! As per my apartment plan the first thing come to the sight when opening the main door is the dining table. Is that okay?or should we plan an indoor plant to cover it slightly?Will that look good? Yes, I would suggest you place something in between (like a divider). An indoor plant would do the job too! Where you place it for the looks will depend on your own preference. You shouldn’t be worried with that much of a distance. Both you and your husband are in the East group, meaning East, Southeast, South, and North are favorable locations in the house to place the main door, ideally also facing those directions I just mentioned. If direction cannot be adjusted, you’ll need to find the five elements of the front door (based on its direction) and see how much of a match it is to yours. Thanks so much for the really informative article. In my bathroom, there are two skinks and on each side of the sink are cabinets with mirrored doors. Essentially, these mirrors are facing each other directly which from my research, is bad as if creates disharmonious energy, correct? Is there a cure for this? I was considering replacing the cabinet doors. Or perhaps if I place something in the middle between the two sinks? Thank you! Sorry, these are the medicine cabinet doors with mirrors on them that face each other, hopefully that made sense! I see that you asked Uncle Dixer the same question. I’ve emailed his response to you. Would like to ask regarding our main door facing straight towards our maingate. Is it bad Feng shui? This is fine, and a lot of setup is like that. Although having a curved road from the gate to the main door would be more appealing. I’m in the process of buying a 2-story townhouse and are just waiting for the lender’s approval. It is my first home ever and I am married with a 1 year old daughter. Yesterday, I brought my family with me to a home inspection and that is when I was told about some negative things about my townhouse. 1. There’s a very big and old tree that is located right in front of my front door. The land that this tree sits on is a higher than my walkway and the tree is about 10 or more feet away from my front door but there is a walkway between my front door and this tree so it does not obstruct the entrance other than being there to provide shade. The branches do spread towards my master bedroom window and roof. I look around the front common area and notice there are other trees being planted in front of other’s neighbors front door too just not as big as mine. I doubt HOA will remove this tree anytime soon so I’m not sure what can be done about this? We also can access the house through the back garage so if the front tree cannot be removed, would entering from the back garage door solve this issue? 2. 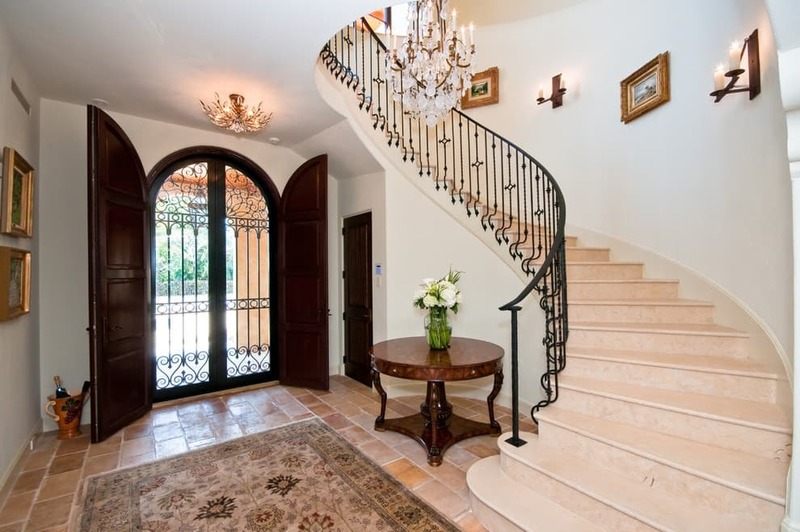 Once you open the front door, there’s a stairway leading up to the two bedrooms upstairs. We are thinking of remodeling the bottom section of the stair to turn to the left so that it’ll face towards the living room. What do you think about this? 3. My front door is facing the North direction which is pretty bad since my KUA number is 8. I have read somewhere that “If your front door faces this direction, your family may leave you.” This is really freaking me out. We are already in the Escrow process and it took us a long time to find a townhouse like this that is in our price range and good location. That is the reason why I had put a deposit on the house but after finding out all these negative things about the front door, I’m just freaking out and not sure what to do now. Should I pull out from buying this house or continue and try to find ways to solve the front door issue if there are any solutions for it at all. Any help from you is greatly appreciated. 1.) The tree attracts Yin energy. Just make sure the branches don’t get too close to your house and you should be ok. 2.) You have a great idea with this! 3.) Front door using your Kua number is one thing. Try using the front door’s Five elements (determined by direction) and match it with you and your family’s Five Elements (determined also by birth year). Thank you Victor for your advice, really appreciate the prompt response from you! We have decided to look for a different home as this old tree facing the front door is too great and we will not be able to modify it in any ways. Your blog has helped me a lot in term of understanding more about front door and house feng shui. Many thanks! 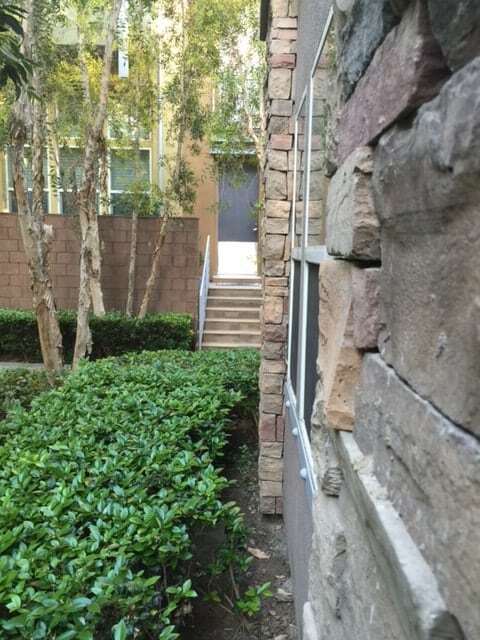 The front door of my apartment faces a wall, this is when I open my front door, that opens inwards, there is a wall 6 feet away, which creates a small hallway. I hung on the wall, right in front of the door, a painting in pastels colors, of a sunny desk and a big window open to a beach, giving the feeling of “continuing”. To really make an entry to my apartment I have to make a left and go into an opening. Now I am in my living room. My question is, due to I am using the Westerns Feng Shui, to position the Bagua, should I use the real front door ( the one that face the wall) or should I use the opening on the left of the front door, the one that allows me to really entry to my living space? However, I’m not sure about the Western Feng Shui. Nevertheless, I still think that even for Western Feng Shui, your front door is the one that opens to the wall and not the hallway. Thank so much for your response. Now I know that I have to set the Bagua with the Career right where the front door is. Sadly, that means that the Romance and relationship area will be where my bathroom is. What cure can I use? And I am asking this, because indeed is needed. The best option is to keep it clean and well-ventilated! Having the bathroom there would not be an issue if you keep it clean. I am somewhat at lost of what to do. We purchased a house and the foundation has just been laid out. I just now realized that the front door is directly facing the sliding door to the back. To the left of the sliding door are 3 good size windows. I was thinking of switching up with windows and the sliding door. Is having a window directly in front of the front door also bad feng shui? Yes, but not as bad. You don’t really have to switch up the windows and sliding door. All you need is to place something in between the door and the sliding door/windows. A simpler divider would do, or any other taller furniture that you like would do too. My front door or main door has two door one is screen door (made by metallic) from inside once open it push outside the other one is made by wood (from outside push inside) but my door is directly facing the wall and stairs steps to downward. and in the ceiling have beam. what remedy will do, please give me some advices. It’s hard to comment without really seeing it. I’m assuming half your front door faces a wall and half faces the stairs. In this case, you can use colored carpets that lead the guests/yourself towards the living room. It’s not a perfect remedy, but I cannot comment further without really seeing it. As for the beam, there’s nothing to worry because I don’t think any of you would be sitting and resting right underneath it. Hope all go well with you and family. I have a question and would like to ask you. My front door is actually on the side and facing toward another door to the garage. Would it be ok? If it’s bad, what can I use to cure it? Thank you ! Just within the context you provided, you are fine. One minor thing is you might be receiving less Qi from your front door. No biggie! You can’t really make the wall go away. Also, it doesn’t look as if you need to make the wall go away, because it doesn’t seem to be giving you bad Feng Shui. Just wanted to know what can be done if the main door faces the main service gate. If your main door faces the main gate, placing something in between can help, assuming that the road from the gate to the main door isn’t long and straight. You’ve probably seen people placing a small garden or a water feature so that the road goes around it. That’s the idea. Hi Victor! I really loved this aricle of yours! I’m from the southeastern (maybe central) Europe. A smal country named Slovenia. I had search and read some books but I cant find nothing about the vranda. I rent a small condo (garsoniera) with the “entrence” before the real strong main door. So.. I have a 3×3 m2 squere construction made with glass and glass-door before/ahead my entry door. And te glass door is in diagonale with the main entry door. Second.. pleeaseee answer to my questions..
1. How or maybe where can i start with mi bagua. Glass veranda door or main door?? In this veranda i have just shoes and coats. 2. After the main door directly on the left i have a bed. It is separate with a nice courtains for separate… than.. the condo continue like a tunnel.. second on the left a bathroom… third on the left or maybe in front a small kitchen with dinning table and a living room. Then directly a beautiful smal balcony. This area is ful of sun. The entrens with a bedroom in not. For apartments, the main entry for Qi is usually the balcony because that’s where most energy comes in. If your balcony has ample sunshine and faces an open field (not obstructed), you’re in good shape. In order to know what direction is good to sit in the office, what should I use – the main door of the building (facing East) or main door of the office (facing North) since they faced at different direction?. For the Feng Shui of the office, you’d need to use the main door of the office and not the building. As for which direction to face while you’re sitting in the office, you can use the favorable directions of your own personal Kua. May i ask you if my main door do not have much sun light, is there a way that i can do by installing a bulb on top of the main door and on 24/7 or there a way that i can buy to hook on top of it and run by battery. Thank you. Definitely a good idea. Although the bulb won’t have the strong Yang energy like sunlight, it still brings light and Yang energy. After My dining area is a 6 inches drop to the kitchen area. Not too sure is it a bad fengshui..
My front door is a double glass doors with motives and facing straight to my back porch. My back porch door is also double glass doors (clear glass doors) so people entering to my house can see the swimming pool at my back yard. My front doors is open inward but not my back porch double doors (open outward) My fireplace is inside the house located near by the back porch doors (left side against the wall) with a tv on top of the fireplace. So to avoid the unwanted situation my husband and I decided to put some furnitures there like couch and sofas faced to the fireplace so we can watching the tv there. Behind the couch I put a narrow table with some decorations. So once you entering my double front doors will see the narrow table, couch, and sofas, and double glass back doors overlooking the swimming pool. I was thinking to put like a big round table or a piano in the middle of the room. Do you think this decoration will looks okay to you or do you have any better idea? Please help. Thank you so much! Yes, the decoration will do. What’s important is to place some kind of furniture between your front door and the door to your backyard. apartment’s door in japan and some of asian countries was purposely made to open outward for safety issues, and yes , making people more difficult to barge in. Uninvited guest will need more effort to pull open the door and people inside can defend more easily. According to my friend who is an AIFSA member, there is no prohibition in ‘standard’ fengshui for main entrance to be made to open outward. What’s important is location and facing direction. Thank you. Great insights. Thank you for sharing them!! You’re definitely right – the location and facing direction is MUCH more important! It’s a little hard for me to picture this, so I can’t give you an accurate opinion. But if the Form of the trees are bad (which I wouldn’t think so), there is a possibility that it can act like light posts with its Xa (but I doubt it). I also wouldn’t go as far that it’ll prevent your daughters from getting married. Trees are sometimes good in front of the door because it can help block the bad out (sometimes the good too). I reside in an apartment and my front door is painted yellow with Square shaped mirrors attached in a pattern. That is, when a visitor comes, it would reflect their own image. Please tell me if this affects my home energy in any manner. This should be ok considering your front door is an apartment door. hi what if my main door of my apartment faces partially the bedroom door ? is it an issue and the remedy other than moving the door ? It is ok because the doors are not directly facing each other. Adding a door curtain can help protect your privacy. Help! My front door has mirror and glass panels on the outside pushing the chi from the house and any chi that gets in when the door opens flows out the back glass sliding doors which are aligned with the front door. Also there is no way to place furniture between the front door and rear sliding glass doors as that would block guests abilities to walk from the front door to the rear of the house. Any suggestions would be much appreciated!! Thank you! If you can keep the rear sliding glass doors closed, you’ll still be able to gather Qi into the house. Hi Victor! Thanks for your advice. There are two main entrances to our church, both of them actually perpendicular to the main wall, which generally faces south. One door is in the southeast corner, with the door facing west, opening into the narthex (vestibule). The other one is in the southwest corner, with the door facing east, again opening into the narthex. The doors are both made of wood. Do we consider them both to be south-facing, since the wall generally faces south? Or do we consider the one in the southeast corner to face west, since the door actually faces west, and the one in the southwest corner to face east, since the door does actually face east? In other words, is it the direction of the door itself, or the wall, that we take into consideration? The key here is determining your church’s sitting and facing, which is facing South. As for the door’s direction, I don’t think you should bother too much with it since it is not a residence. Where the door’s location/section is relative to the church is more important than it’s direction. Thank so much. Due to your post, I can design my house perfectly. My Kua number is 1. Is it true 16 steps is bad Feng Shui? Is there anything I can do to counter? Not sure what you mean by 16 steps, but I think you’re referring more to numerology than Feng Shui. What about the interior side of the front door. It is a south facing door, so I think I will paint the exterior red. But what about the interior side? Can I paint it any color or should it be a specific color too? Like the same as the outside, in my case red. For the interior, you can paint any color that you like. There’s no need for it to be red. Also, only paint your door red if you like that color. 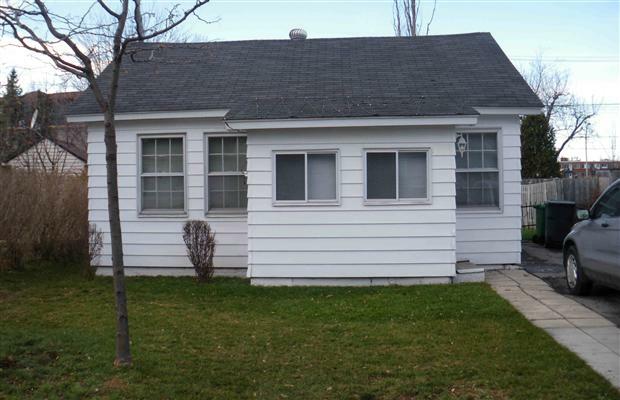 I am looking to buy a house but it is the second house on a block of land. The front door of the house (it is a double storey house) faces the back of the double storey house in front. Is this bad feng shui and is there any way of curing this? There are many considerations here. For one, if the distance between the houses are far apart, then there’s nothing to worry. I suggest that you consult a practitioner if you’d like to solve your Feng Shui issues. Hi been planning to put up an aquarium behind the Front door. Front door and the house is facing EAST. Would this be ok? and there is a wall where i be setting up the aquarium. So the moment you enter the house the aquarium’s right side can be seen. Would this be ok. ? This is ok. Just make sure that the aquarium doesn’t affect the way your front door opens. Also another one, when facing through the main door or as you enter, can see the kitchen, the sink and the faucet. But not the Stove. will this be bad? If it is what can i do to counter it? These are ok. Don’t stress too much about this. What you should focus on is how your home is gathering Qi. I need some advice. We moved into a 100 yr old house. It has many Feng Shui challenges. The term “Feng Shui Nightmare” comes to mind. The front entrance is a big problem. The front door is smaller, than the door leading into the kitchen. When you come in, there is a door to the immediate right, and a closet door, a few steps in front of you. A huge open space leads to the left, into the living area, which has lots of windows. My question is three fold. 1. Is it a “no no” when the front door directly faces a closet door, (after 3 steps in )and if so what cure can I use to remedy the situation. (The door also has a diamond shaped window in it. Does this need to be covered up? Just from the information you’re giving me, the Feng Shui of your place isn’t really a “nightmare”. Front door facing closet door is fine. The diamond shaped window is also fine too.